Iron is full of impurities that weaken it; through forging, it becomes steel and is transformed into a razor sharp sword. Human beings develop in the same fashion. We have finally got the opportunity to upload some pictures from the local seminar hosted on February 24, 2018. It is with great pride that the newest Shodans wear their Hakama during practice. This is a great priviledge. 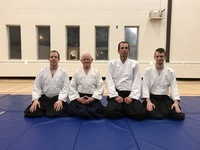 Congratulations to Peter Chafe, Dwight Sparkes, and Richard Westcott, pictured below with a proud Sensei McDonald. The Aikido Institute of Newfoundland is pleased to announce the new ranks of 4th kyu for Boyd and Meghan upon successfully passing their testing on March 15, 2018! Congratulations to all! The Aikido Institute of Newfoundland would like to offer a huge thanks to all who attended the local seminar. It is always a great to be able to get together to share this wonderful Martial Art. We would also like to congratulate the new shodans: Peter Chafe, Dwight Sparkes, and Richard Westcott; and also the new 2nd kyu Pat Gulliver - Great tests all! It is a great honor to announce the very recent Promotion of Colleen Hogan, and Paul Glavine, to 5th Dan. Please click on the link (thumbnail) below to view a message offered by Sensei Derm Mcdonald in recognition of this great accomplishment. Congratulation Colleen and Paul, Anybody who has had the priviledge of practicing with you, knows how truly deserving you are. We look forward to many more years of practice. We look forward to a great opportunity to get together for a day of practice. 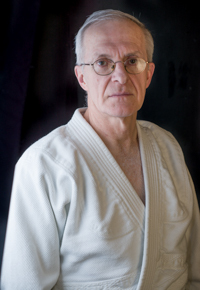 Dermot McDonald began his practice/study of Aikido in 1972 under the direction of Graham Burt Sensei, who had come from England, where he had been a student of Senseis Nakazono and Abe. In 1977 Burt Sensei encouraged Dermot to open another dojo to help spread and develop Aikido. 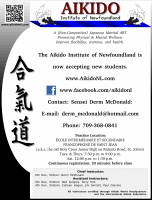 McDonald did so and it remains today the Aikido Institute of Newfoundland, where Dermot continues to train and to teach enthusiastically. Sadly, in 1979 Burt Sensei passed away; it was revealed, however, that in his will he had left Dermot his sword. This was a great honour, of course, and was interpreted to mean... please continue. Realizing that he still needed a teacher, shortly thereafter Dermot attached himself to Yamada Sensei of New York Aikikai. 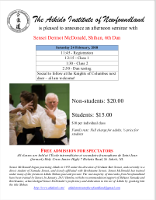 Over the years, McDonald says he has been very fortunate to have trained under many of O Sensei's original students and foremost Aikido Masters. 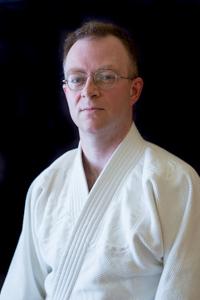 Currently Dermot holds the rank of 6th Dan and is a certified Shihan - Master Instructor. Godan Neil has been practicing aikido for a long time. Terry began his study of Aikido in 1982 at the age of 32.He studied exclusively under Sensei Dermot McDonald, whom he considers his mentor and friend. Terry was fortunate enough to accompany Sensei on numerous Aikido seminars given by many of O Sensei's Deshi. He took instruction from the Doshu, Saito, Tamara, Yamada, Kanai, and most of the technical committee among others. He is presently the oldest, and longest practising student of Sensei Dermot McDonald Shihan. Terry is presently retired and enjoys spending time with his family and grand children. 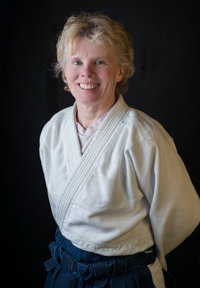 Colleen has studied aikido under the direction of Derm McDonald Shihan, since the late 1980’s. Highlights along her aikido passion include shodan grading (1998 under Y. Yamada Shihan), nidan (2003, C. Berthiaume Shihan), sandan (2007), yondan (2011) shidoin certification (2012). Colleen’s passion for aikido led her to travel to various dojos and seminars to seek additional training; she has been grateful to have received instruction from students of O Sensei: Kanai Sensei, Chiba Sensei, Tohei Sensei, Tamura Sensei, Yamada Sensei. She also has trained in seminars with other masters of aikido: C. Berthiaume Shihan, D. Waite Shihan, F. Turner Sensei, B. Britton Sensei, P. Bernath Sensei. In 2012 Colleen travelled to Japan and spent time training at Hombu Dojo. She also visited O Sensei’s dojo in Iwama and was warmly welcomed for an overnight stay and training. Colleen looks forward to more aikido study. 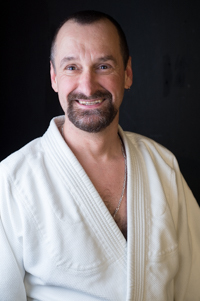 Paul began training in Aikido in 1989 under the direction of Derm McDonald Shihan. He graded for shodan in 1998 (Y. Yamada Shihan), nidan in 2003 (C. Berthiaume Shihan) and sandan in 2007 (Y. Yamada Shihan). 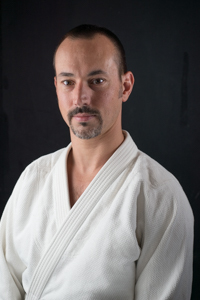 In 2011, Paul was promoted to the rank of yondan and in 2012 received his shidoin certification. Paul has attended seminars with some of Aikido’s foremost master instructors (N. Tamura Sensei, M. Kanai Sensei, T. K. Chiba Sensei, and Y. Yamada Sensei). He travels to seminars as often as possible. 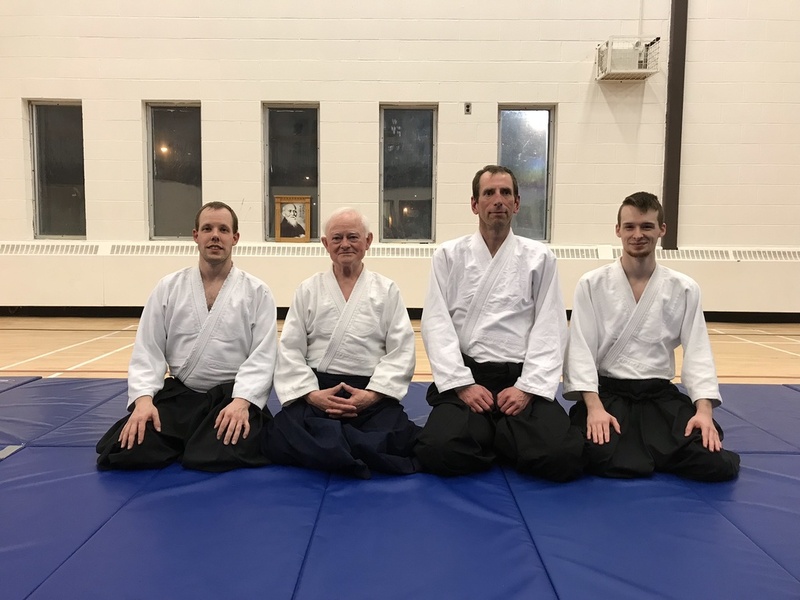 Jim started Aikido with McDonald Sensei at Brother Rice High School in late 1987, joining Graham Burt Aikikai shortly thereafter; he is currently fourth dan, fukushidoin. 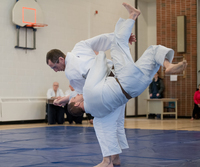 As well as practicing at the Aikido Institute, Jim and Paul Glavine started a children's club, St. Matthew's Aikikai, in 2006. This club continues to operate today with Jim, Paul, and Colleen Hogan sharing the teaching duties. He is currently joined on the mat at Aikido Institute by his two sons, as well as by his daughter at St. Matthew's. 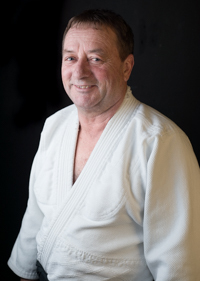 Fred began his training in 2004 at the Aikido Institute of Newfoundland. He received his Nidan in 2013 by Sensei Dermot McDonald 6th Dan Shihan. He received his Shodan in 2010, grading conducted by Sensei Dermot McDonald 6th Dan Shihan and Claude Berthiaume 7th Dan Shihan. Fred has received his current rank of Sandan in December 2018. 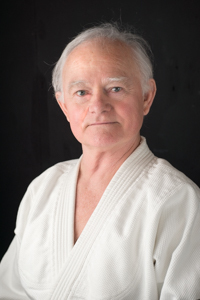 Fred continues to practice, train and enjoy Aikido under Sensei Dermot McDonald. Charlie began his pratice in Sept. of 2000 under the supervision of Dermot McDonald Sensei, Aikido Institute of Newfoundland. Over the years Charlie was fortunate enough to be uchi deshi at New York Aikikai under the direction of Yamada Sensei and Sugano Sensei, where he gained immeasurable and unforgettable exerience and insight into the art of Aikido. In 2011 Charlie was tested and received his Shodan under the careful eye of Claude Berthiaume Sensei Shihan. Today he continues to train and share his experience at the Aikido Institute. 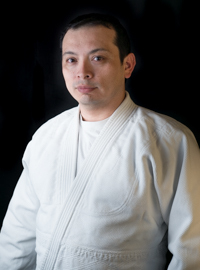 Juan joined the Aikido Institute of Newfoundland in late 2005 and attained shodan from Claude Berthiaume Shihan, in 2012. In early 2016, he successfully tested for nidan under the supervision of Robert Zimmermann Shihan and Dermot McDonald Shihan. 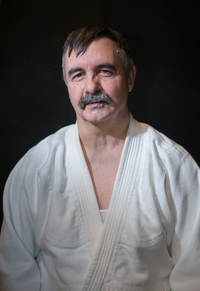 Juan continues to practice diligently under the supervision of Dermot McDonald Shihan, Chief Instructor of the Aikido Institute of Newfoundland. He has participated in seminars instructed by great aikido masters such as Doshu Moriteru Ueshiba, the late Nobuyoshi Tamura, Yoshimitsu Yamada, Claude Berthiaume, Robert Zimmermann, Donovan Waite, Yumi Nakamura and others. Juan likes to visit and practice in other aikido dojos when travelling. 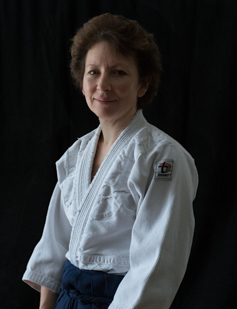 Colette began practice in 2005 under the supervision of Tom Alteen and Tony Cumby at Fudoshin Aikikai. She attained Shodan from Donovan Waite Shihan, 2012, while under the supervision of Kevin and Bill McDonald. 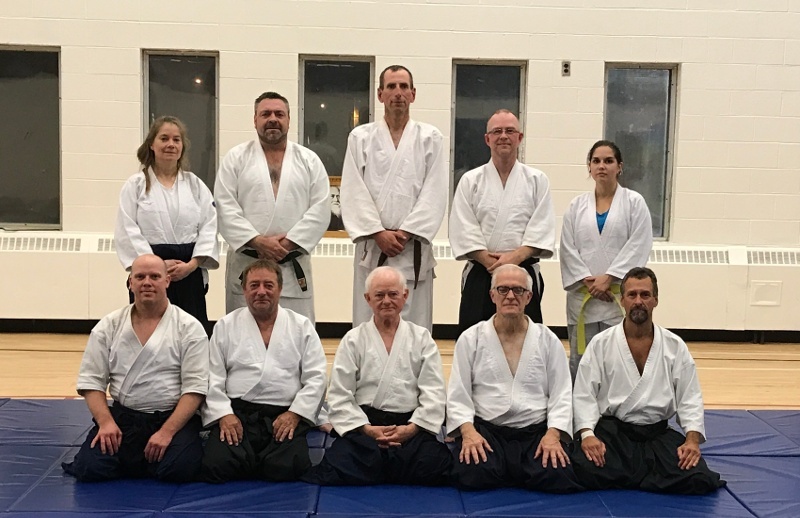 Colette is presently training at the Aikido Institute of Newfoundland with Derm McDonald, Shihan, Chief Instructor, and has attained the rank of Nidan in December, 2018. She is enjoying immensely every moment on the mats. Stephanie began practicing aikido in 2002. 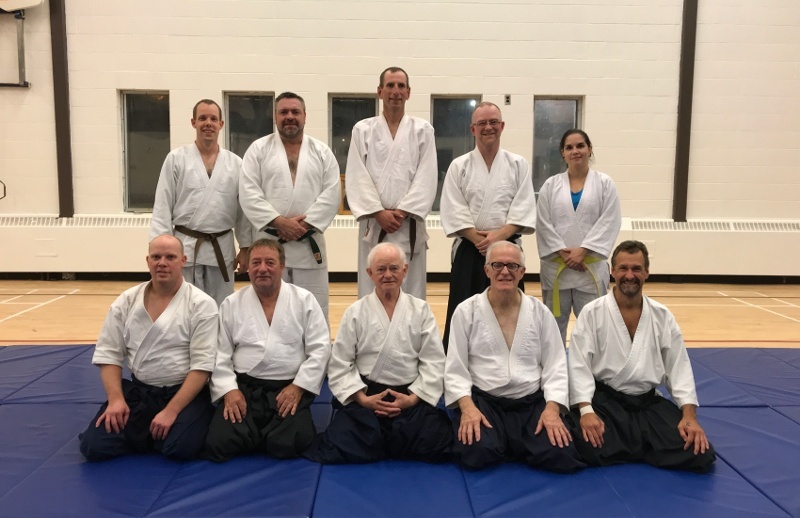 Her shodan grading took place in 2013 at the Aikido Institute of Newfoundland, conducted by Dermot McDonald Shihan and Claude Berthiaume Shihan. 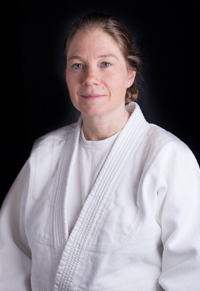 Stephanie has attended seminars taught by Claude Berthiaume Shihan, the late Yukio Kawahara Shihan, Yumi Nakamura Sensei, Donovan Waite Shihan and Tsuruzo Miyamoto Shihan. She has visited dojos in different parts of the world, including Hombu Dojo in Japan. Stephanie has attained the rank of Nidan in December of 2018, and continues to practice with dedication. Off the mat, Stephanie is a physicist and a mother. Dave attained the rank of shodan in 2011. Donald began his aikido training in 1993 and continued sporadically as opportunity allowed until 2006 when he began and maintained a regular practice schedule. 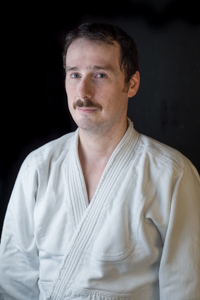 He achieved the rank of Shodan, in 2012, graded by Derm McDonald, Shihan, Chief Instructor, Aikido Institute of Newfoundland, and Claude Berthiaume, Shihan, Chief Instructor, Aikido de la Montagne. 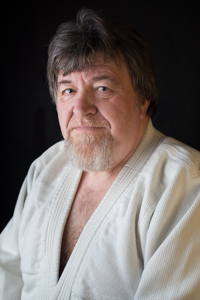 Donald has attended seminars instructed by Doshu Moriteru Ueshiba, Yoshimitsu Yamada, Claude Berthiaume, Yumi Nakamura and continues to train in incredible company at the Aikido Institute of Newfoundland. Donald is a local real estate agent. He was joined on the mat for a time by his daughter, Krystal Hobbs, and he hopes she’ll return to practice someday soon. 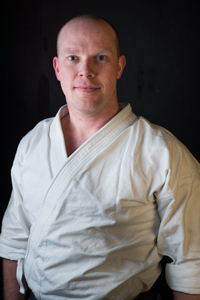 Jason began his training in 2005 at the Aikido Institute of Newfoundland. He received his shodan in 2010, grading conducted by Dermot McDonald 6th Dan shihan, and Claude Berthiaume 7th Dan shihan. He has and continues to attend several aikido seminars/ summer camps through the USAF, and CAF per year to further his martial training. 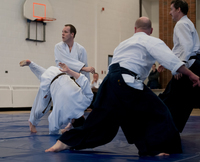 He attributes his progress and growing interest in aikido to all the instructors and students over the years, who share the same enjoyment in training. Jason works in the healthcare industry as a primary care paramedic. Following lenghty consideration, Gerry finally began his study of Aikido in 2004 at the Aikido Institute of Newfoundland. After diligent and consistent training he tested successfully and attained his Shodan under the direction of Derm McDonald Shihan in 2011. Gerry continues his study and training today with interest and curiosity ........ and, with a particular focus on the practical and martial aspect of the art of Aikido. Mark began practicing aikido at Graham Burt Aikikai under the direction of Derm McDonald Shihan. 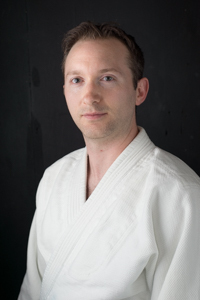 After a long absence, he returned to practice in 2008 under the direction of Kevin McDonald Sensei and Bill McDonald Sensei and was graded for shodan in 2012 by Donovan Waite Shihan. Mark has attended seminars instructed by Yoshimitsu Yamada Shihan, Donovan Waite Shihan, Claude Berthiaume Shihan, Yukio Kawahara Shihan, Massimo di Villadorata Sensei and Yumi Nakamura Sensei. 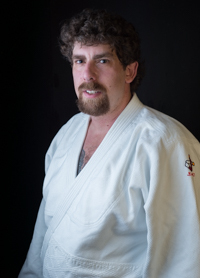 He currently trains at the Aikido Institute of Newfoundland once again under the direction of Derm McDonald Shihan. The Aikido Institute would like to offer everyone a very Merry Christmas, and Happy New Year. We look forward to another great year of practice in 2018, have a safe and Happy Holiday with your Family and Friends. We will be eager to practicing once again in 2018. Here is a copy of the new Poster for the club, Please click on the thumbnail to download the PDF file. The gymnasium looks great with a fresh coat of paint, that really brightens up the atmosphere. We look forward to seeing everybody on the mats.